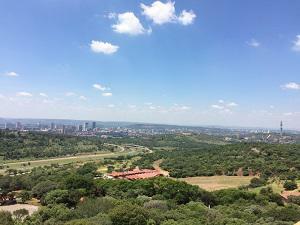 Pretoria is a city located in the northern part of Gauteng province in South Africa. Known as the Jacaranda city. One of the country's three capital cities, serving as the seat of the executive branch of government (Cape Town is the legislative capital and Bloemfontein the judicial capital). There are 3 Universities in this academic city with the Council for Scientific and Industrial Research (CSIR) located in its eastern suburbs, the South African Bureau of Standards can also be found here making the city a hub for research. Pretoria is the central part of the Tshwane Metropolitan Municipality which was formed by the amalgamation of several former local authorities including Centurion and Soshanguve. Pretoria is named after the Voortrekker leader Andries Pretorius, and within South Africa is popularly known as the "Jacaranda City" due to the thousands of Jacaranda trees planted in its streets, parks and gardens. Pretoria is located approximately 55 km north-northeast of Johannesburg, it is in a transitional belt between the plateau of the Highveld to the south and the lower-lying Bushveld to the north. 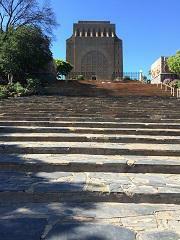 The altitude of Pretoria is about 1,339 m. Learn more about South Africa's history on this tour. This is a half day tour. On our Pretoria tour you will visit historical sites in Pretoria like the famous Voortrekker Monument, Paul Kruger’s House, Melrose House, Church Square and the Union Buildings. Each place has its own unique story to tell in this rich historical city.